The Motorola Assassination and the Future of Donbass. Motorola in the Novorussian victory parade in Donetsk, 2015. On October 16th, legendary Donbass militia commander Motorola (born Arsen Pavlov) was killed by an explosion in Donetsk. A device was hidden in the elevator of the building in which Motorola lived with his wife and child, and detonated as Motorola returned home, killing both he and his bodyguard. He had survived at least two previous assassination attempts, the most recent being an apparent botched bomb plot in August. Motorola’s life before the Donbass war is low on detail. He was born in 1983 and raised in Rostov, western Russia, he was a Marine in the Russian military, fought in the second Chechnya war early 2000s before coming to prominence during the Donbass war. Motorola was a leader of the pro-Russian militia groups that have been fighting the Ukraine government forces since 2014 when a Western engineered colour revolution swept the elected Ukraine government from power and replaced them with ultra-nationalists and IMF flunkies. 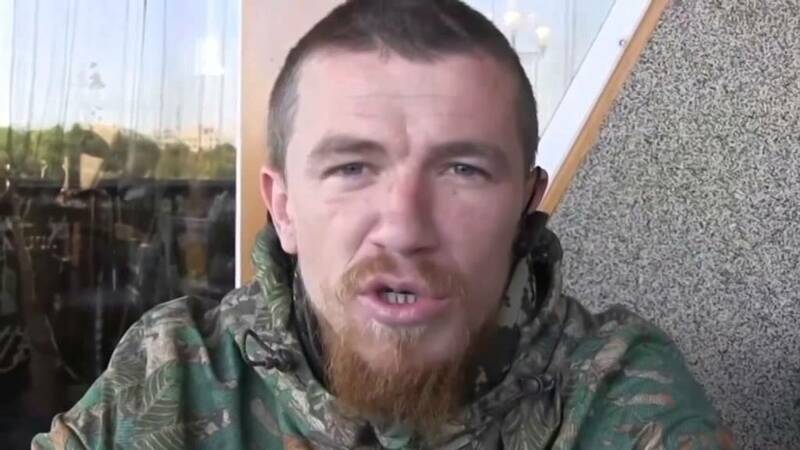 Motorola was the commander of the Sparta battalion, who operate as a semi-special forces grouping within the DPR militia, he was involved in many of the most significant battles fought by the militia, playing a key role in the successful Second Battle for Donetsk Airport among many others. Motorola engaged in numerous noteworthy acts of courage, exposing himself to close range tank fire, and generally leading from the very front of the front, giving his men confidence by the sheer force of his will and personality. As a professionally trained soldier, Motorola was not only a fighter, he also operated training camps for less experienced fighters where they were taught infantry tactics. The sad truth is that such is the state of Governance in the Donbass republics that there may never be any real investigation into this murder. The attacker managed to sneak into the lift, plant the device, which could be done in ten seconds, and then monitor the traffic into the lift in order to press the button at the correct moment. My initial assumption that the Ukraine and their allies must have murdered Motorola did not survive the reading of a typically thoughtful analysis from the Saker. Having had a rethink, this is the picture that has emerged of the potential suspects. The operation is widely regarded as being beyond the level of professionalism of the Ukraine security services, and while it remains possible that they were behind this it seems at the less likely end of the hypotheses on offer. At face value it also seems highly unlikely that the operation would be directed by a Western agency as the death of Motorola does not change the overall situation to the benefit of the West to the degree worthy of the risk or resources the operation required. The idea that Russia was involved can also be all but discounted. Motorola was an employee of Russia, if Russia thought he was dong a bad job, they would simply send him home. They had no motivation to waste time sneaking around planting bombs, he was their man, he obeyed orders, whatever they wanted to do to him, they would simply summon him. The details of the attack mean it was either a very high-tech operation or it was done by someone very close to home. In recent years, almost all the major military and political and military leaders of the Donbass republics have been targeted for assassination, including the two putative heads of state in the respective republics, Alexander Zakharchenko of Donetsk and Igor Plotnitsky of Luhansk. Infighting is part of the story and the Motorola killing fits into a broader pattern of events in the self-declared republics, with a partial breakdown of law and order and the absence of a real system of justice. The best explanation for Motorola’s death, without having access to hard facts, would be some type of inside attack directed from within as part of some rivalry or betrayal. The loss of Motorola is an immense psychological and symbolic blow to the beleaguered self-declared republics but it will not change the fundamentals of the situation in east Ukraine. In the eastern Ukraine, Russia created a military and political force able to veto any attempt to include the Ukraine in NATO ans once that goal was achieved the Russian priority changed to mending political ties with Europe, hoping to end the EU sanctions. Donbass battalion commanders Givi and Motoriala. 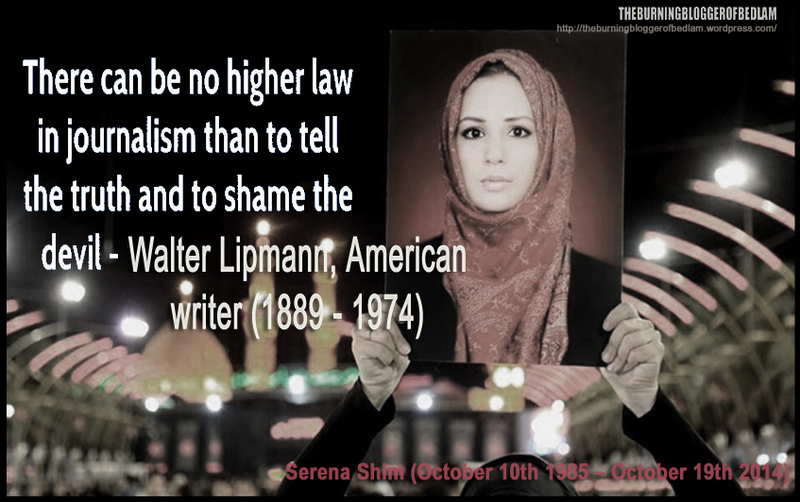 In order to understand why this war is happening, we must look back at the post Cold war period. At the end of the Cold War, the Soviet Union unilaterally dismantled itself, ended the European empire built on the back of the victory over the Nazi’s, abandoned communism and ended the reason for NATO’s existence, the Warsaw pact alliance grouping. Rather than engage in a constructive reconciliation process, the West simply viewed Russia as a weakened enemy, to be exploited and attacked. This was inexplicable because the official reasons for the conflict between the West and Russia, communism and the Soviet empire, were gone. At the behest of Neo-liberal ideologues the assets of the Russian state were sold off at a tiny fraction of their value and later, foreign jihadists were inserted into Chechnya in order to start the Chechen war in the 1990s. Ibn Khattab (l) and Shamil Basayev(r), two of the CIA’s men in Chechnya in the 1990s and 2000s. Key leaders of the Chechen insurgency were trained at the same training camps the CIA and the Pakistani ISI had earlier trained the Afghan mujaheddin. Shamil Basayev was later responsible for operations that led to the deaths of hundreds of civilians, including the Moscow theatre siege and the Beslan massacre. Wayne Madsen reported that the NSA “went dark” over the North Caucuses at the time of the Beslan attack. The implication is clear. Basayev, along with Saudi jihadist Ibn Khattab, led insurgent attacks on the provinces bordering Chechnya in 1998, attacking both Dagestan and Ingushetia, a ridiculous provocation designed to end the relatively peaceful informal independence of Chechnya. Russia’s Gradual Encirclement by NATO. On the external front, a dozen former Warsaw pact nations were included in an eastward expanding NATO, breaking numerous assurances made to Russia at the time of the German reintegration. The broken deal is a secondary issue, the elephant in the room is why does NATO even exist post Warsaw pact? And if the purpose of the expansion was not to encircle Russia then what was it? The leadership of the West continued the Cold War unilaterally and for a very long time they met very little resistance, (the 2008 war against Georgia being a major exception) until they staged the colour revolution in Ukraine at the start of 2014. The Ukraine had an elected government, all the politicians on all sides were corrupt. Protests against the government began after the President chose not to pursue closer economic ties with Europe. After several months the protests grew extremely violent and caused an equally violent response from the security forces. At this point, Russia made a compromise deal for the President to stand aside and hold early elections but the West continued with the putsch and in late February during the latter stages of the Sochi Winter Olympics the coup succeeded and the President of the Ukraine fled. This was the breaking point for Russia. Russia could not risk losing the Sevastopol naval base to a hostile NATO takeover of the Ukraine, sOnce the Olympics were finished, Russia took dramatic action, a co-ordinated military political operation saw the Ukraine military evicted from the Crimea with very little violence and soon after that the people of Crimea voted to secede from Ukraine and to join the Russian Federation. Russia was able to achieve these things at very little cost and the reason for this was despite the fact that the Russian actions were driven by the need to retain Sevastopol, the people of Crimea were genuinely horrified by the coup government, largely regarded themselves as Russians all along and were relieved to leave a dysfunctional in the best of times Ukraine. The operation was a huge success and Crimea is well in the process of being integrated into Russia, the operation succeeded because the goals of the Russia government broadly matched the goals of the people of Crimea. It was one of the most stunning events in recent history, the West was powerless to act and the subject is so painful that it still reduces the minions of the West to quivering rage whenever it is raised. The core support for the deposed president Viktor Yanukovych was in the east of the Ukraine and the coup government decision to banish Russian as a language of the Ukraine, along with the ultra-nationalist elements in the government saw a rebellion begin in the east in the months following the coup. By the middle of 2014, militia groups had formed in the eastern regions, the Ukraine armed forces tried to enter the east and evict these groups from their positions and a war broke out between them for control of east Ukraine. At some point Russia decided to lend military and logistical support to the insurgents and by August 2014 the militia were bolstered by the presence of covertly inserted Russian soldiers, the Ukraine attempts to seize the eastern areas largely failed and following a terrible defeat for the Ukraine forces in the Battle of Ilovaisk the first Minsk agreement was signed in early September 2014. The Donbass war in many ways resembles the West’s “dirty war” operations all over the world, from Syria to El Salvador and Guatemala, the core tactic is the same, an enemy is attacked using cut-outs in a proxy war. Following Minsk the people of the Donbass are trapped in a netherworld with no prospect of escape. The Ukraine state regards them as foreigners, enemies, people to be shelled as punishment for their disloyalty. The Donbass militias are also trapped, they cannot win the war, they cannot lose the war, instead they must simply fight to keep their pocket of territory and remain the Russian bargaining chip in the Ukraine. The people were given false hope that Russia would either help them achieve independence or absorb them as it had Crimea. Neither option was ever part of the plan so the war, despite the tactical victories and the courage and skill of the fighters, was a trick played on the participants. The Donbass militias and the people are a pawn that are there to be able to give Russia the ability to veto any attempt to include the Ukraine in NATO as well as act as an armed buffer on Russia’s western border. That is why they can never be allowed to lose, that is why they are not supposed to win independence or to join Russia, and that is why while the Russia actions in Crimea can be seen to have improved the lives of the Crimeans the same cannot be said of the Donbass. What Russia has done to these people, whilst being perfectly rational and probably in the Russian interest, was low and cynical in many ways. For the Ukraine state, the Donbass war has been an immense disaster and humiliation. Once the border posts between east Ukraine and Russia fell, the war was effectively over with no possibility of a victory as Russia now had the ability to provide sufficient assistance at any time in order to protect the Donbass pocket. The Minsk 2 agreement, reached in February 2015, is the concrete representation fo Russia’s decision to walk away from the Donbass war. The agreement is highly favorable to the Ukrainian side, including for example the condition that the Donbass militia groups go into exile upon disbandment. This commentary from Mikhail Belyayev provides a good summary of the one sided nature of the deal that Russia forced upon the Donbass republics. “The publicized text of the ceasefire agreement that was signed in Minsk is what this very real betrayal looks like. The betrayal of everything that the Novorossiya Militiamen fought and died for. The betrayal of Novorossiya itself, because, based on the text of this agreement, there is no place envisioned for Novorossiya, nor for the Militia and nor even for any “special status” for the People’s Republics. All that this so-called ceasefire agreement provides for is a temporary status of local self-government in certain areas of the Donetsk and the Lugansk regions. Even that is conditional on the complete elimination of the Militia and the release of all Ukrainian prisoners of war; moreover, the Militiamen are obliged not only to lay down arms, but also to leave the territory of Ukraine. In return, Ukraine promises amnesty to the parties to the conflict, a national dialogue, and certain measures aimed at improving the humanitarian situation in the Donbass. The LPR and the DPR are not even mentioned in the text of the agreement, and their representatives have signed it without any titles or ranks. Independence and statehood? Novorossiya? A temporary special status in certain areas of the Donetsk and the Lugansk regions—here is all you have of independent Novorossiya. Here is all your freedom and sovereignty. You can write out these words a thousand times, print them on paper, and then shove them deep down your throat. In any event, death by strangulation is better than death through shame. Ukraine does not even intend to give autonomy to the People’s Republics. She did not even deign to mention these very Republics in the agreement. Temporary self-government in certain areas—that is the extent of Ukrainian generosity for the rebellious Donbass. The answer is obvious: Russia told them to sign it and they completely depend on Russia for their existence so had no choice but to sign. In the 20 or so months since the Minsk 2 agreement was made, a low intensity wear has continued, the Ukraine have the upper hand but the achievements are slight. Meanwhile, Russia is only providing the absolute bare minimum of military assistance to the militia groups. It has been a very disappointing time for the people of the Donbass as it sinks in that Russia will never accept the eastern republics into Russia, nor will the Ukrainians implement the Minsk agreement. The Ukraine may well be continuing the war at this time simply in order to maintain the flow of US military assistance. Given the immense corruption of the Ukraine government and the futility of what they are doing, this may be the best explanation for their actions. The ongoing fighting only deepens the psychological chasm between the people of the Donbass and the Ukraine state. If the Ukraine wants to retain the Donbass in any meaningful sense the Ukraine must take steps to implement Minsk, and begin the slow process of the physical and political reintegration. Over the long-term, the West is undoubtedly the chief party in the creation of the Ukraine disaster. Treating Russia as an enemy for a quarter of a century at the end of the Cold war was an act of madness, albeit one that is now paying off as Russia’s responses to Western aggression enable the NATO parasites to resuscitate their original raison d’etre- the threat of Russia! NATO and all the other US instruments deserve execration but the cynicism of Russia’s action regarding the eastern Ukraine cannot be overlooked. It would do well for the Syrian Government and their allies to understand that Russia is not anyone’s benefactor, it acts in the Russian interest and in the Russian interest alone. Russia is equally capable of walking away from Syria when it is no longer in their interest and Syria and their allies should always have contingency plans that consider this possibility. For the people of the Donbass the world might as well have frozen over, they are trapped between the geopolitical aims of the West and Russia, their lives are of apparent little concern to either party and the future is bleak. For as long as the Second Cold war persists they will be trapped, sandwiched between the competing geopolitical goals of Russia and the West. (Eng Subs) Clashes in Peski. 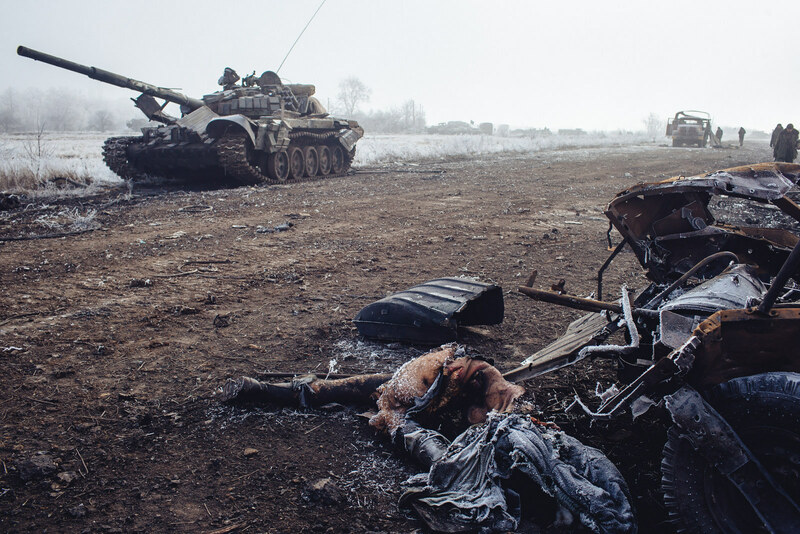 Destroyed Ukraine military hardware and the bodies of slain soldiers near Debaltseve. February, 2015. Sadly it appears that the Donbass War is restarting. That the Ukraine Government was simply trying to buy time, lick their wounds and plead for more money from their Western sponsors. The Clashes are now persistent and intensifying and the Novorussian forces are now apparently conducting their own offensive guerrilla operations in response to the Ukraine Forces constant provocations. as this Kazzura video seems to indicate. The best thing obviously would be for the war to end and never restart and for the Novorussians and the Ukraine Government to come to an amicable and political long term solution. Some Western commentators opine that Russia has invaded East Ukraine and is trying to seize the Donbass region and that is simply not the case. Russia has no intent whatsoever to allow the Donbass to formally break from the Ukraine. Russia’s goal is simple, they want the Ukraine not to join NATO, the Novorussian forces and the people of the Donbass are essentially Russia’s willing and able counterweight to the Kiev Western puppets. Russia has clearly provided material to the Novorussian forces but it has actually been very little. The Official Russian Military budget is over $40 billion a year whereas the Ukraine Military budget is less than two. The nation is going broke and the support from the West has almost all been rhetorical. NATO do not want to fight a war against Russia. Bullying thugs will never ever assail an enemy with real claws, ever. The whole fabricated “Russia” threat is just a fund raising exercise and relevance renewal for NATO. It is a scam. Russia is going to get a “colour revolution” whether they like it or not. There is no other way. NATO has nowhere near the size nor quality of forces to even dream of launching actual offensive operations against Russian territory and the same is vice versa. It is a non-starter with devastating, unbearable losses on both sides inevitable. Presumably this will play out in much the same way as the past two cease fires. The fighting will become more open, the Novorussians will win a small but significant territorial gain. The French and Germans will again plead with Poroshenko to stop and at some point he will presumably listen. What they need to understand is that they are not going to achieve anything because Russia can turn up the support to the Novorussian ten or even one hundred times what the support is today. They are providing the bare minimum and are capable of boosting the support to whatever level required to hold the strongholds of Luhansk and Donetsk, no matter how much support from the West the Ukraine receives . NATO, perhaps due to the level of corruption in Kiev, has actually pledged very little financial military support to the Ukraine forces who will remain out-thought and out gunned, no matter what NATO does and should therefore stop the nonsense, accept their losses and try and get on with rebuilding the Ukrainian state and the economy. 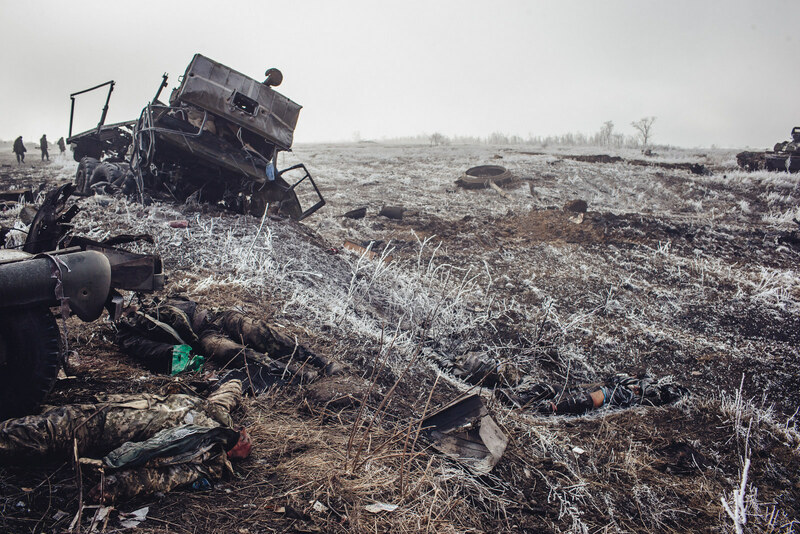 Destroyed Ukraine military vehicle with dead Ukraine soldier on the outskirts of Debalstseva. This is how it ended.